Hello again folks, how is everyone out there?! I've been keeping myself busy over here at Summa Realty. Just closed my Co-Listed house in North Plains, yesterday. Very happy to see those folks get squared away and ready to start the next chapter in their lives. They were very impressed with the quality and amount of effort put forth by Vickie Duchscherer and myself. That is the lasting impression I hope to achieve with every client I help! I also recently started working with a new buyer this week and it has been very exciting thus far. We saw some great houses and even put in an offer on a property. Finger's crossed that we can squeak out a good deal for her on that home. Since I started here at Summa I've been quickly becoming the go-to technology guy here in our office. I am more than happy to assist with creating flyers, interoffice, and marketing materials as I enjoy graphic design as a hobby. I've recently been asked by the owners to help advise and broaden my tech duties as our company grows, which is a very exciting proposition to me! So, that's my update for now. I'll report back shortly, take care. 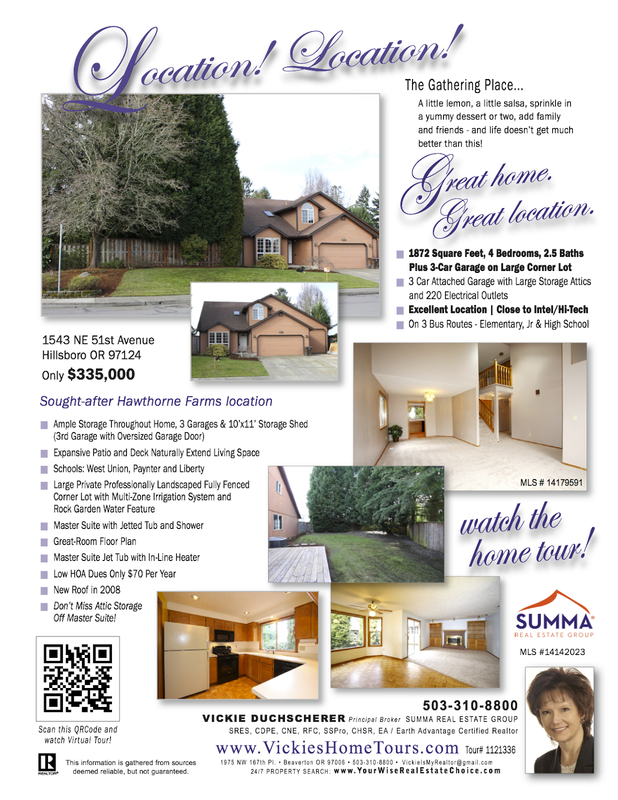 I am holding an open house tomorrow for fellow Summa agent Vickie Duchscherer. Located in the desirable and convenient Hawthorn Farms Neighborhood in Hillsboro. I will have a lender on sight as well to answer your questions about home loans, credit scores and more! Come by and view a great, spacious home with tons of storage space and a large, fenced backyard! Here's are a few links again!